This was the subject of last Thursdays AVA session. Slightly down on members with only 12 or so present. An interesting session, not one of my favourite subjects but you have to take them as they come and it does stretch you. This is my latest attempt at an Amerindian circa 1900. I don't know his name or the tribe. I made an initial pencil drawing using one of my most recent acquisitions a Pentel 07 Graphgear 1000 Draughting pencil. I'm not sure that this is any better than the cheaper Pentels I normally use, possibly more durable. Recent portraits have been done without the time consuming measuring and careful working out or spacing of features. I don't want to become too mechanical in my approach and not be fixated on copying the photo exactly. I don't think the above is too bad in that respect but the facing eye looks a little threatening and perhaps should have been toned down a little. I think the result is fair if not quite up to the standard of my better ones. I'm also trying to stick to Charles Reid's mantra of `small areas of detail, large areas of generality and have been (again) looking at my reports of the Stow workshop and his approach to the portrait he painted. Colours used for the features and skin were Cadmium Red Light, Raw Sienna and Cerulean. To darken the eye shadows Ultramarine Blue was added. The hair is a mixture of Ultramarine, Burnt Umber and Raw Umber. The colours of the shirt include Quinacridone Gold (Daniel Smith PO49), Raw Sienna, Cobalt Violet etc. Brushes used were mainly the Isabey retractable size 6 and Rosemary Kolinsky retractable sable size 6 plus Escoda retractable Kolinsky sables sizes 8 and 10. The reason for the retractables is that this was done at my art group Thursday session. This was the title (subject) at the most recent AVA session. In reality we weren't allowed to use a brush except to mix the paints. I went without a clue of what to attempt. It then transpired we could do an initial drawing so that changed things a little. As I carry much of my kit with me I chose a small palette knife and home-made bamboo pen. I decided to try an Indian portrait using a guide photo from the ipad. I made a quick loose pencil drawing as a preliminary. I've never tried anything like this previously (just as well do I hear!) although I've seen it done in a book by the late Zoltan Szabo. He used a palette knife to paint trees. I painted the eyes mainly with the bamboo pen but this was difficult as you cannot pick up much paint, or conversely too much. In other words control is difficult. Apart from a few small touches all the rest was done with the palette knife. I also used my fingers to spread the paint in places. As you can see it is very loose other then the main detail and one of the advantages trying this is it encourages a loose approach. I'm sure with practice I could improve on it. It certainly gives food for thought. Paint has to be mixed generously and very liquid so you can pick it up. Sometimes you pick up too much but you can spread it about. I made no attempt to get realistic skin tones and used mainly muted colours with blues (Ultramarine Blue) and reds (Quinacridone Rose) to get darks and purples, Raw Umber, Raw Sienna, Gold Ochre and Burnt Umber are also in there together with Sap Green. At the most recent AVA session the subject was seed heads. Not an easy subject but I managed to find a few small branches of berries. Not perhaps as intended when the subjects were drawn up but they are seeds after all. This is only the second painting I've done since I damaged my hand. I coped alright but holding paintbrushes is still awkward. The other factor was that I've hardly done anything - not just over the injury - for nearly three months. Apart from the problems of dry paint - necessitating regular use of the spray bottle - I read once that you need to paint three times a week just to maintain existing standards and more than this if you wish to improve. I was therefore slightly apprehensive. I was reasonably happy with the result although it seemed my ability to do small areas of detail is still impeded. I used a lot of Schminke Translucent Orange (PO71) and lesser amounts of Quinacridone Rose for the berries, Sap and Apatite Green for the foliage and some Teal Blue to make the vase stand out from the background. I know it is far from perfect but hopefully I can continue to improve with regular painting. Brushes were my usual Isabey, Escoda and Rosemary retractables 4, 6 (Isabey), 8, 10 and 12. What do we have here? There appear to be 91 colours with most of the names similar to that of the main manufacturers. A few variations do exist but overall a good range of colours. As far as I can see there are no pigment details and I don't know if this is given on the tubes. Although it doesn't say so specifically presumably the claim is that these watercolour paints will produce results that won't fade hence the use of `conservation quality'. Are there any downsides YES THERE ARE! First of all where are the pigment details? Are they on the tubes? They may be there but I wouldn't consider buying any watercolours without knowing what pigments are used. We then come to the real bombshell PRICE. These paints are only offered in a small 11 ml tube not the more normal 15 or 14 ml or even larger in some instances. There seems to be four series with the cheapest - examples Raw Sienna, Burnt Sienna - at the introductory price of £9.20p (rpp£12.95p), Ultramarine Blue is £11.30p (rpp£12.80p), Cadmium Yellow Light, Cobalt Blue, `French' Cerulean Blue (what is that?) all at £14.20p (rpp £19.95p), Indian Yellow £11.30p (rpp £12.80p) and Quinacridone Burnt Orange £12.80p (rpp £17.95p). Work out the price per ml then compare with Winsor & Newton and others. Open mouthed and speechless? I was! I don't know who these watercolours are aimed at. Are they just for the `top' professionals who can perhaps afford them? I can't see many amateurs paying these prices when there are superb watercolours available from the established leading manufacturers at lower - in some instances much lower - prices. Even the brilliant range from Daniel Smith, the most expensive, at least in Europe, are cheaper in the conventional ranges. If you are interested then I suggest you explore the range at www.lawrence.co.uk. Added 05/10/2014: Thanks to Beverley (see comment below) I now have full pigment details. 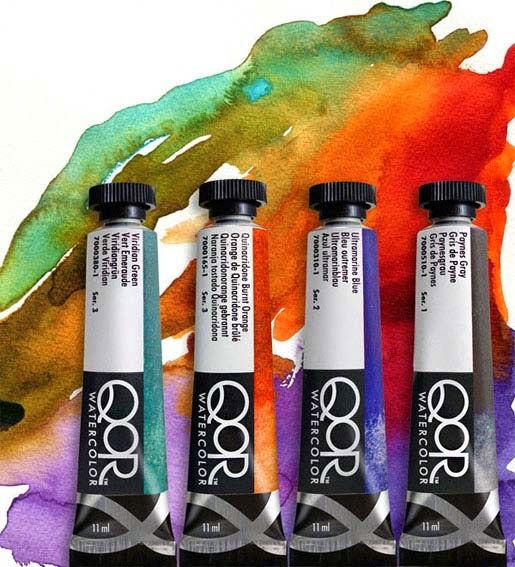 the link is www.qorcolors.com/products/watercolors There are 83 paints not 91. Some 63 are single pigments, 1 four, 9 three and 7 two. Three iridescent paints are included. All paints listed are given either excellent or very good ratings ASTM LF but - oddly - 25 are listed as `not yet tested'. Most or all of these apart from the iridescent ones contain pigments in common use that other makers have rated. The pdf file also includes details of opacity, staining and granulation. All the pigments listed are those in use by the leading makers. I can't see anything exceptional or really different. There are a few oddities in paint compositions but in general all seems pretty straightforward. I realise that I haven't tested these paints so they may have some superior qualities but the only difference (on paper) I can see is the use of `aquasol', described as a `conservation quality binder'. I'll be interested in what the artists magazines say about these paints but I won't be trying them at these prices. Some tall claim and I still maintain price is important, with many excellent makes - who have a long history of making watercolours - at lower prices, and with watercolours already expensive I doubt whether this will resonate with many artists. We shall see.